It’s Kathy with a K. Today I wanted to address – how to pick a duct cleaning company. I know you are going to think I am blowing my own horn or that I’m biased but while writing this I am trying my very best to disassociate myself from this information and only give you what I know to be true about the duct cleaning business. Always select a company that knows what it is talking about and can answer all of your questions no matter how small. Select a company that has been around for a long time so you know they will be around later if you need them. Many companies come and go and are working with shop vacs, never a good idea. It is not that easy to stay in business for along time if you are not good. Try to compare apples to apples. Different companies will call the same work different names which may become confusing. Be sure to look beyond the fancy words and gimmicks and make sure you are getting the basics done. Duct cleaning is nowhere near as complicated as companies will have you believe. Price isn’t always the best indicator – knowledge is. Always select a company that will guarantee it’s work. A rock solid guarantee. 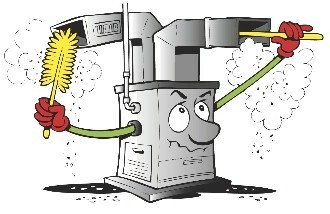 Remember that all duct cleaning must be done using a push and pull method. This means pushing dirt with high pressure air and pulling dirt with a large vacuum unit. An agitation system should be added to the service also. This means something mechanical that will disturb (agitate) the dust in the vents, moving it away from the sides and bottom of vents. This should always be an air skipping system. To get even more additional dirt loose it can also include yet another agitation system such as brushing, whipping, etc. This part is optional. My worry about how folks pick companies is that they don’t just go with price or that they pick a company they have never heard of. Price shopping is wise no doubt however price alone means nothing. Now I am not just saying that because we are expensive and I don’t want you to buy from someone who is cheap. You will find us rather a good competitive price, many more companies are more expensive than us so it is not that. Fly by night companies are very cheap, they may have nothing to stand behind them, you definitely won’t know who they are, and probably won’t see them again as they will be gone next year. Every year about 10 new duct cleaning companies come into Winnipeg. Almost all but none of those will stay around. It’s that time of year to get your duct cleaning in the great north so I hope this has helped.